Sorry I never got around to recapping episode 5 of this season of Rachael vs. Guy, but the Super Bowl took priority, as did the launch party for our new book, Food Lovers' Guide to Baltimore. Plus nobody reads these recaps, right? Which is why I'm going to be (relatively) brief here. Last week, Rachael's team of three battled Guy's team of one in a food truck challenge. Despite missing about a third of his customers because he was working alone, Dean was moved on to the finale. With three members left in the other team, and only one finale spot open, Rachael and Guy did a non-blind taste test. 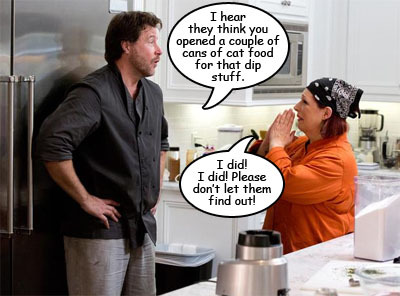 The ended up rewarding the other finale spot to Carnie because they knew neither Kathy's hummus nor Hiney's mad skillz with hamburgers and hot dogs could win the competition. 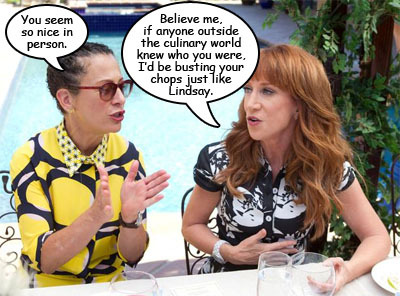 For this final challenge, Carnie and Dean head to a mansion in Beverly Hills where they will be messing up a perfectly lovely kitchen cooking a three course meal for eleven people. They'll be using what Guy calls a "mystery kitchen," meaning they won't know what foods will be stocked, so they have to be able to plan on their feet. They'll have 30 minutes to make an appetizer, 40 minutes for an entree, and 20 for a dessert. 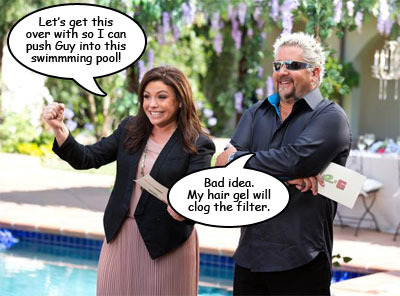 Now this is where the Food Network could have made things interesting. They could have stocked the fridge with calves' liver, tongue, and herring, and the pantry with nothing but lentils and canned pizza sauce. But nooo...there's a nice assortment of popular proteins and everything else needed to make a tasty meal or two. And they're off! Carnie immediate decides she wants to make a tuna dip, which sounds like the grossest thing in the world. I mean, that's what our cat's breath usually smells like. Carnie's in full panic mode (when is she not?) and can't find the canned tuna in the pantry. Meanwhile, Dean is Mr Ambitious. He wants to make seared scallops, but in their pre-meal powwow, Guy put lobster in his head. When he finds both in the fridge, he uses both, along with about twenty-three other components. Apparently he thinks he's on the Next Iron Chef. Rachael and Guy come in for a visit and take pity on the two celebs by giving them sous chefs to work with in the form of old friends. Suddenly, with her friend's help, Carnie calms down enough to locate the tuna and can now make her slop dish. Dean uses his friend to make some of the 1,000 different elements of his overly-complicated plate. Outside, the guests are assembling and find their seats at a table arranged under an arbor that is covered with what appears to be wisteria. But it can't possibly be real wisteria because there would also be thousands of bees swarming the area. I type this as someone who once lived with a wisteria-covered, bee-infested arbor. 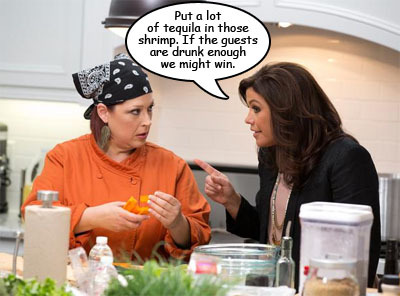 Anyhoo, apart from Rachael and Guy, these guests are bigwigs in the food industry and include Suzanne Goin and her husband David Lentz, Nancy Silverton, Jet Tila, Michael Cimarusti, and Brad Miller. I'm sure you're able to look these guys up, right? Also dining with them are the directors of Carnie's and Dean's charities, and comedian Kathy Griffin who looks like she gave up eating but claims to actually like food. Predictably, Dean's dish has too many elements like mango gastrique and butter-poached lobster. Most of the chefs try to be nice about it, but David Lentz and Brad Miller both decide to piss in Dean's cornflakes. Former Top Chef Masters competitor Michael Cimarusti, however, is a nice guy and says that the way Dean scored his scallops before searing them was new to him and a great idea. Liar. Surprisingly, the chefs seem to enjoy Carnie's cat food surprise tuna dip, but do complain that the texture is a bit runny and there's entirely too much of it on the plate. I think a tablespoon would have been too much. For the second course, Dean is overdoing it yet again by wrapping petit filets with flank steak and serving it with smashed red potatoes and a thousand other fiddly components. Carnie at first wants to make a simple chicken piccata, but switches gears and produces something slightly more complex: an herb pesto-coated pasta with tequila lime shrimp. The guests admire Dean's creativity and think he clearly spends a lot of time reading cookbooks. Burn! His flavors are great but the dish as a whole is disjointed. David Lentz and Brad Miller say something unkind. Most of them (apart from Lentz and Miller) then say nice things about Carnie's dish - the pasta is well cooked, the pesto is tasty, etc. It's hard to tell who's winning here. Finally, the celebs come out with their desserts. Carnie has made apple fritters and served them with ice cream and whipped cream. They are delicious, perfect, and simple. Dean has made grilled pound cake with macerated berries, caramel sauce, and syllabub and you know that he thinks he's going to win because he knows what "macerated" and "syllabub" mean. His dish again has too much going on, and most of the guests agree that the syllabub has too much alcohol in it, but his effort is impressive. After dinner, the guests fill out comment cards with questions about most and least favorite dishes and who they think should win the challenge. Later, Rachael and Guy read the results to the celebs, who have been reunited with members of their family and friends. Except for Dean's wife, Tori Spelling, who is presumably too good to show up for something on the Food Network. Her proxy, a woman holding what looks to be Dean's youngest child, is much better-looking. So who wins? Aww...you don't really care, do you? 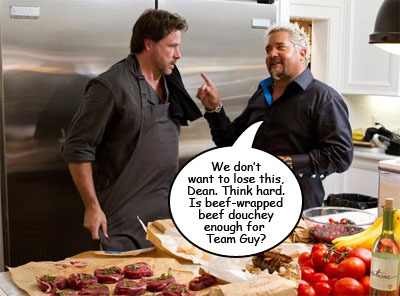 It's Dean, who we've known all along to be the winner, since he's the only celeb with actual cooking aspirations. He gets $50,000 for his charity. Carnie is a winner too, since the Food Network generously awards $10,000 to her charity as well. Do you think there will be a third season? Stay tuned. Or not.